I’m on vacation so I’ll keep this short (lucky for you! 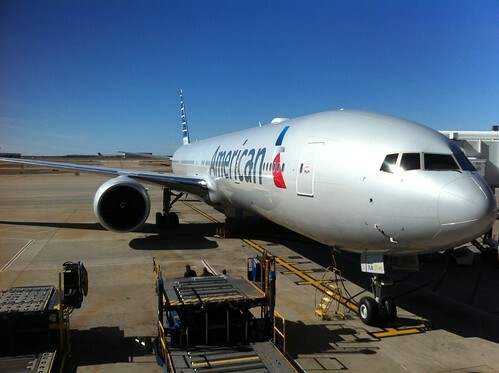 ), American has released their latest domestic widebody schedule which is good through November 20, 2013. Now big surprises, but two changes: they added a third 777-200 flight between Miami and LAX, and summer widebody service between Chicago and Honolulu has dropped from the schedule. I had hoped that American would add 777 service between DFW and OKC for OU’s home games, but it didn’t happen. I’m no aviation economist, but American is missing out on some big potential profits; if they charged $300 round-trip and $10 a beer, they’d make more money on this route than all of their South American flights combined! Anyway, here’s a Google Docs spreadsheet with their August 27, 2013-November 20, 2013 widebody schedule. You’re at least admitting you’re no aviation economist. Like you, so many people think that having an aircraft full of passengers is indicative of a profit-generating flight. In reality, cargo can account up to 75% of profit on any given flight. Whereas a flight to solely vacation destination, can be profitable, but make no mistake; American is not flying to 7 Brazilian cities some of them up to 5 times a day to bring in passengers. Companies like Opel/GM, Volkswagen, Ford, as well as distributors shipping perishable agriculture from Brazil to Asia account for the majority of that growth. Haha, I concur with the DFW-OKC route for OU games!